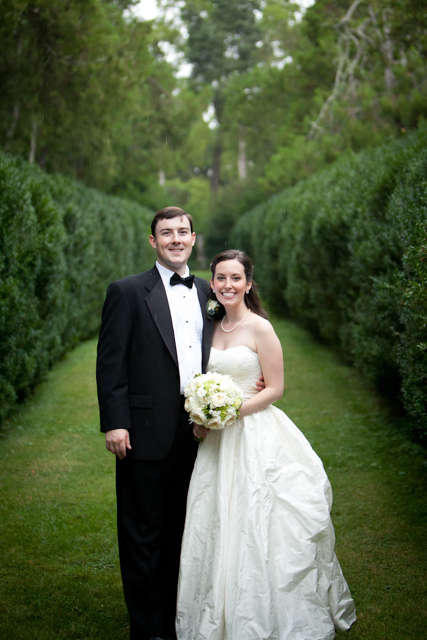 Lauren and Leck married over the summer at Oatlands Plantation. 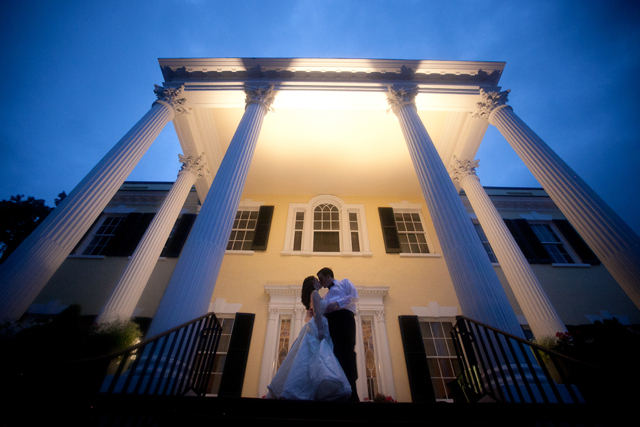 This historic home is one of Loudoun Counties most beautiful estates. The gardens here are an incredible place for portraits, cocktail parties, and wedding ceremonies. Many thanks to event planner Aimee Hardenbergh of True Wedding Events who is an absolute delight to work with, and the super talented Kristi Odom for these incredible photos. 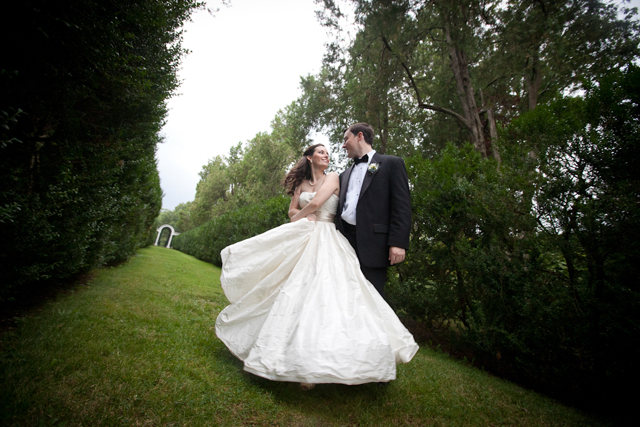 I simply love the picture of this couple dancing in the garden. Maids wore J.Crew gowns. 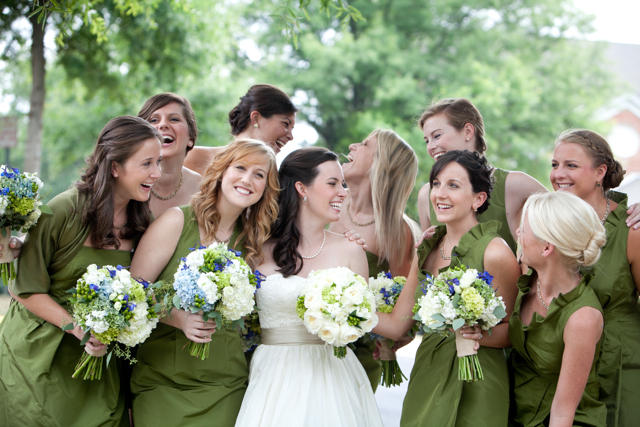 The rich green tone was outrageously beautiful with the blue and green wedding flowers. 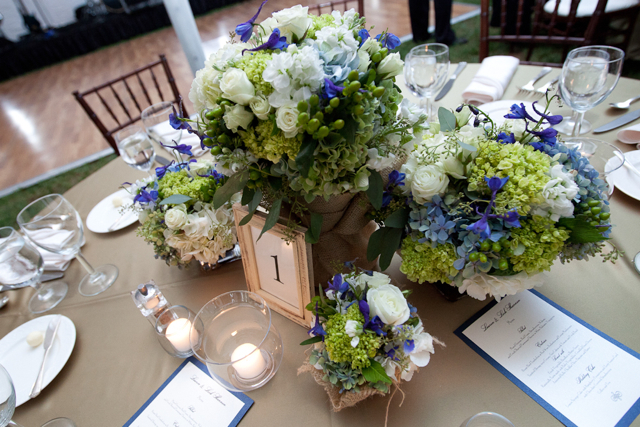 Maids carried white stock blue and green hydrangea, white phlox, white spray roses, blue delphinium, green seeded euc, and green hypericum. 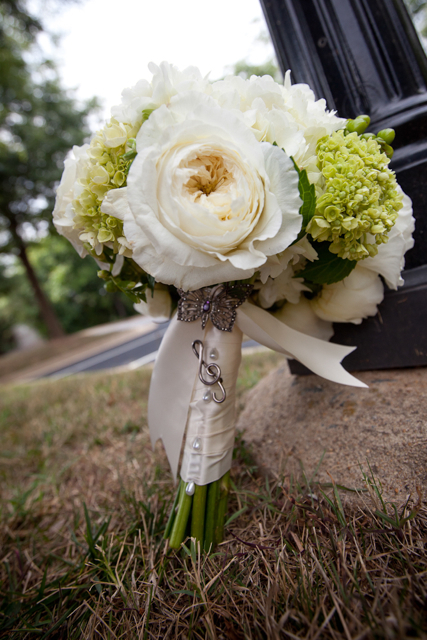 Lauren carried white cabbage roses, mini green hydrangea, white phlox, and green hypericum berry. 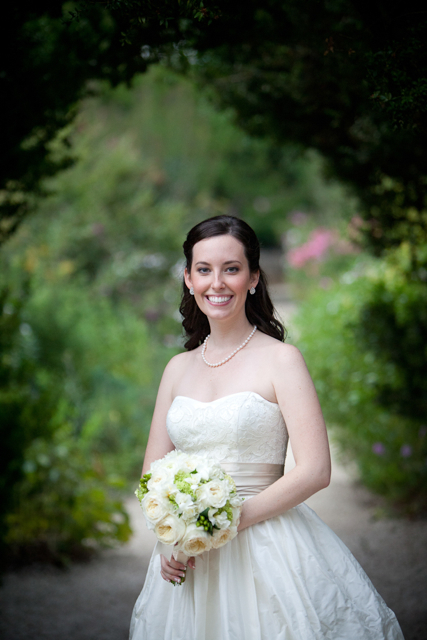 The bouquet was bound satin ribbon and vintage brooches provided by the family. 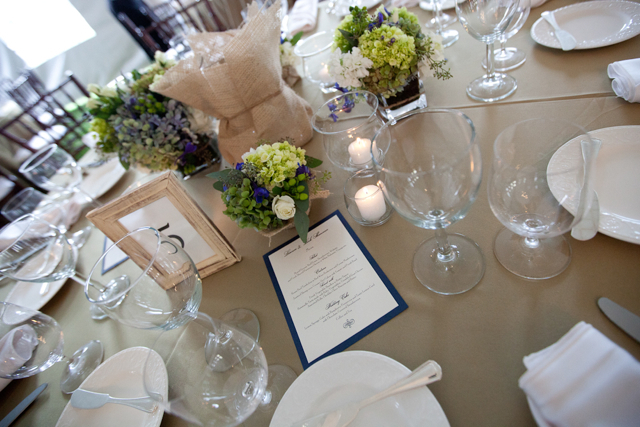 Half of the tables had a burlap runner and a full compote bowl of flowers. The other half of the tables featured a vase that was wrapped in burlap and small mini designs that were either wrapped in burlap or twine. The burlap was an addition the bride loved but due to the elegant and formal environment of Oatlands the MOB wanted it to be used tastefully and simply. In an effort to use the 9 bridesmaids bouquets I came up with this centerpiece design because it featured one vase in the center of the table. 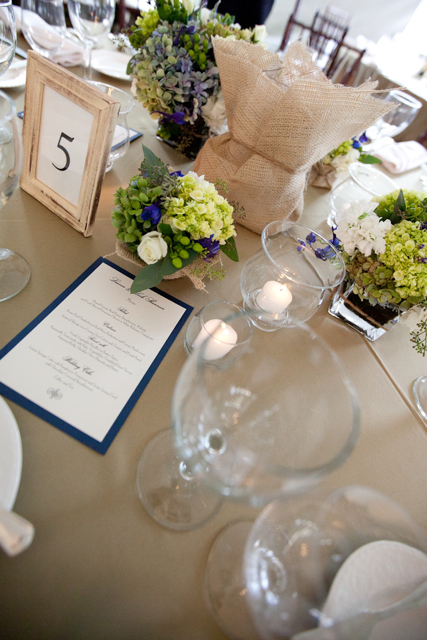 The vase was wrapped in burlap to hide the stems of the maids bouquets and it also reflected back on the tables with the burlap runners. The maids slipped their bouquets into the vase during the cocktail hour. Because the family wanted the tables to look full and lush we also added 3 smaller designs. 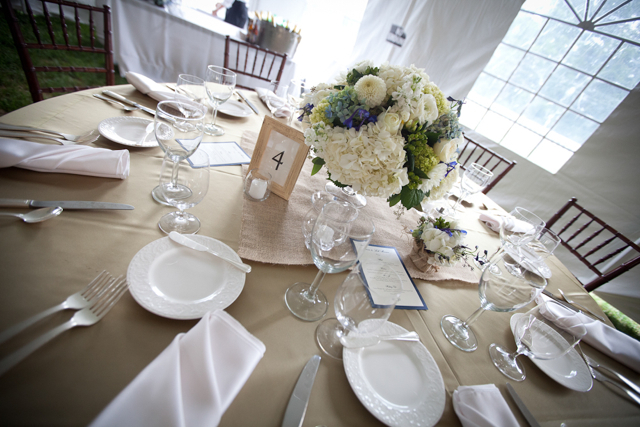 The burlap and the mini designs completely covered up the fact that we were using the maids bouquets as a centerpieces. 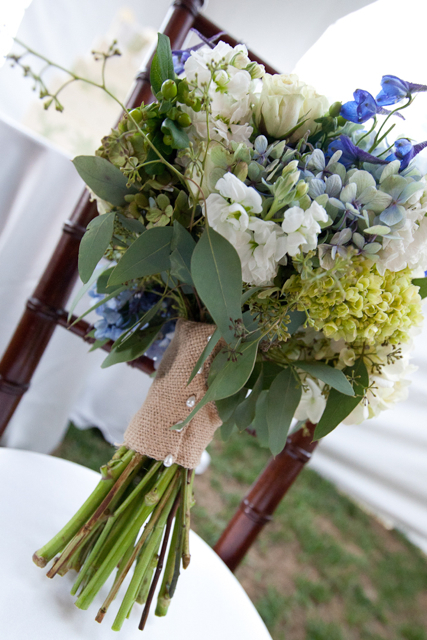 Maids bouquets were wrapped in burlap and bound with pearl pins. This wedding was a beauty. Happy married life Lauren and Leck, thank you for choosing Holly Heider Chapple Flowers. Beautiful job, I LOVED your flowers 🙂 What a great wedding!